It’s hard to believe that it’s December 31st… this year has flown by! 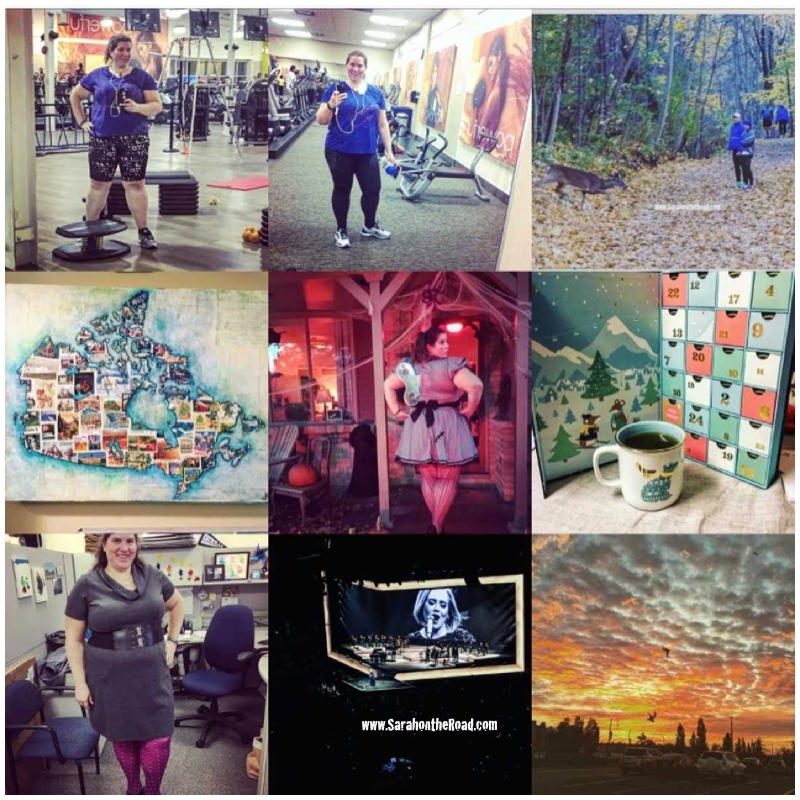 I must admit 2016 has been a year of ups and downs…so many great things happened. 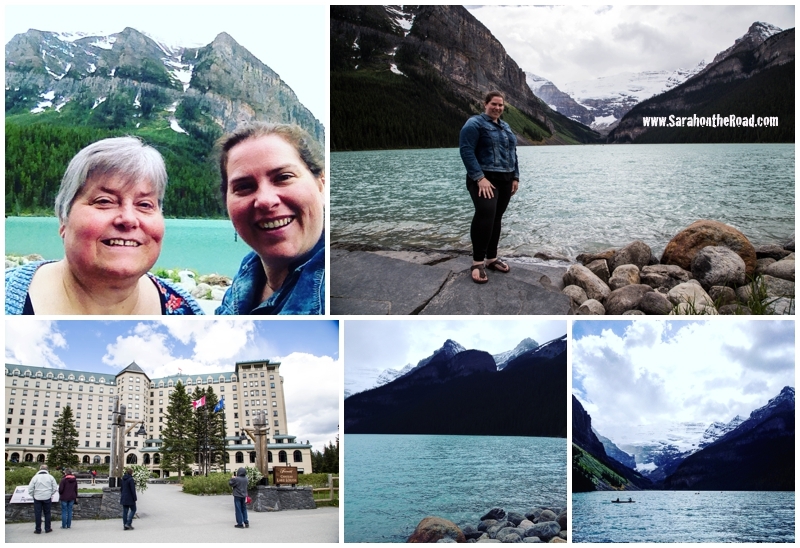 So many great travels…Family weddings combined with a trip to Lake Louise, Banff and Canmore with my mum. Two weeks in Winnipeg visiting old friends. 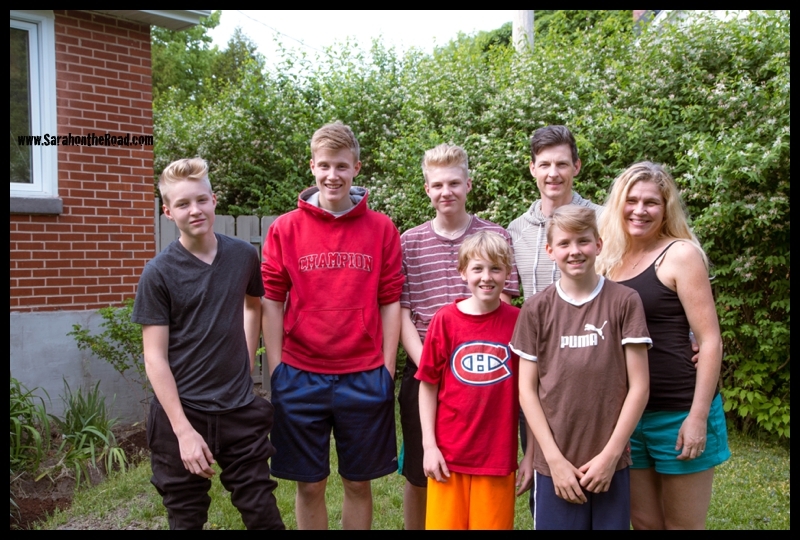 2016 also had a lot of really great long weekend road trip visits: visiting cousins in Montreal for a weekend! Going to Colorado and finally seeing first hand the beauty of that place. Visiting my friend in Trenton a few times!!! 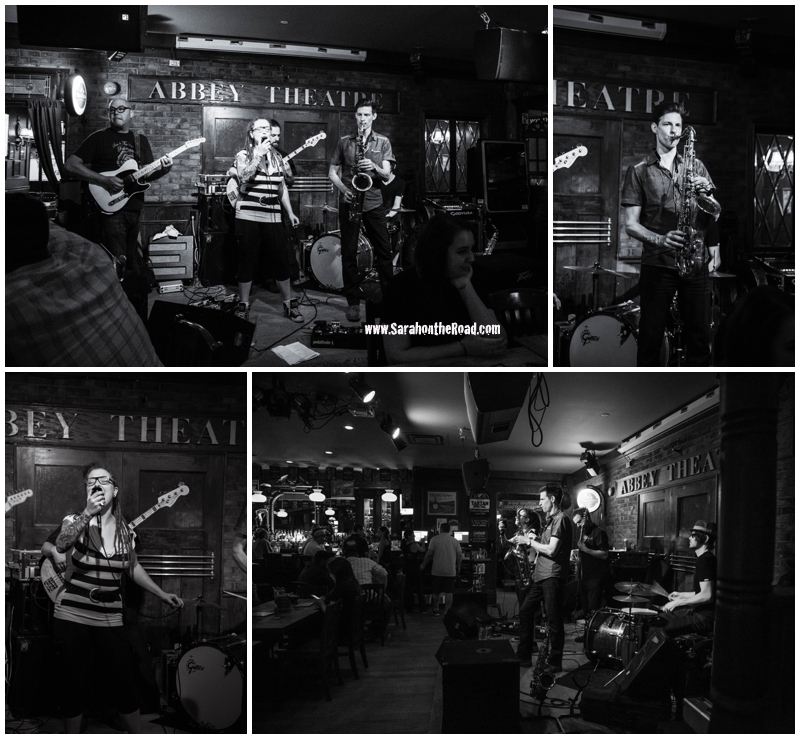 Weekend trips to London to visit friends… so many memories and lots of fun and adventures. I’m not going to lie and tell you the whole year was perfect…because it wasn’t. Part of me can’t wait to kick 2016 out the door and welcome 2017. I think the thing I learned this year is that you sometimes can’t control circumstances or things that happen…but the one thing you can control is your reaction to them. You can let that one ‘bad’ moment/circumstance/thing cloud the rest of that day…and then it might turn into a week and even a month…and before you know it you’ve had a bad year! So as hard as it is sometimes the best thing is to let it go…and try to look for the positive… because every year has it’s ups and downs. It’s the valley moments in life that make the mountain top view so much more memorable. Counting my blessings and wishing you more. Hope you enjoy the New Year in store. Have a joyous New Year! 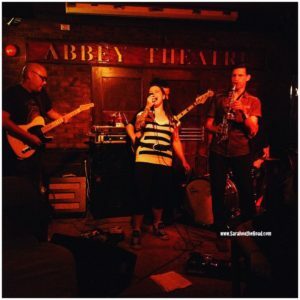 This entry was posted in Holidays, Life in Ontario, On the Road on December 31, 2016 by Sarah on the Road. This past weekend I also got to meet my blogging friend– Keenan in person. Just over 4 years ago we first started exchanging emails…I was living in Pangnirtung and he had recently moved to Colorado. 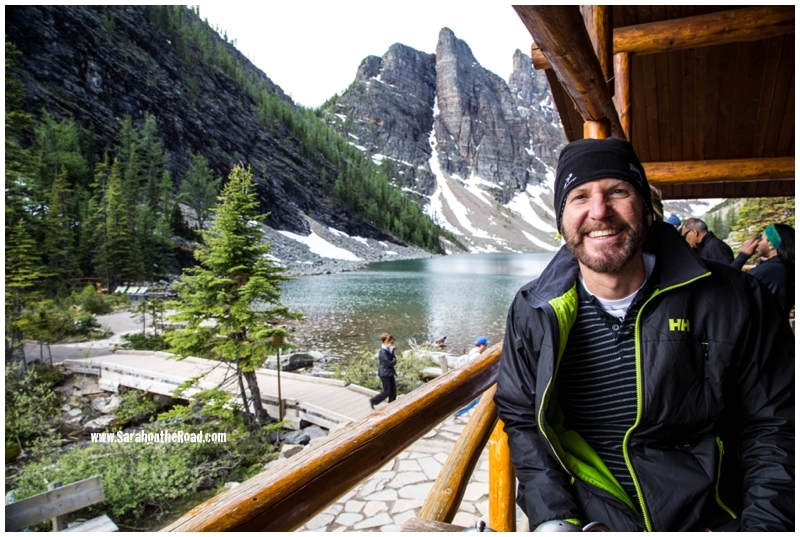 He totally had switched up his life and had taken on a 52 hike challenge for the year! 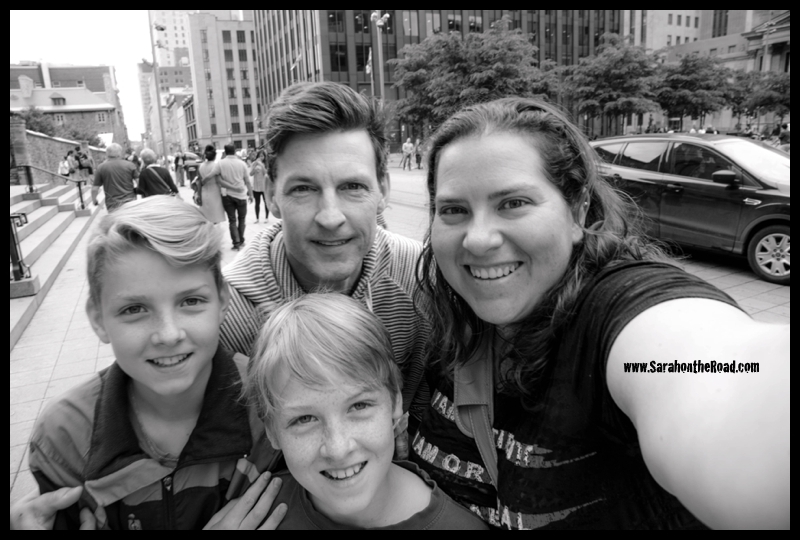 We became friends over the years as we exchanged info on the how to’s of blogging and just random stuff happening in our lives. At the time we started talking Keenan was just setting up his blog. I think we exchanged emails for almost two years before becoming Facebook friends. 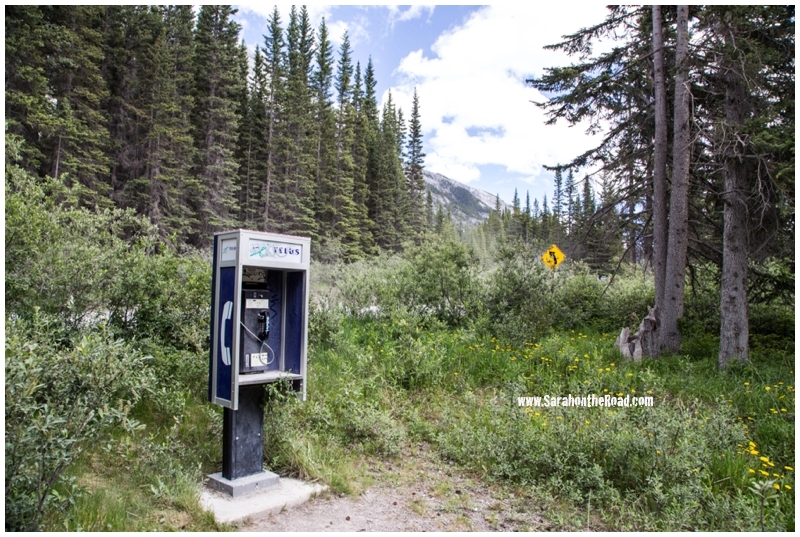 He’s even done a guest post here on Sarah on the Road when my mum and I went to El Salvador. 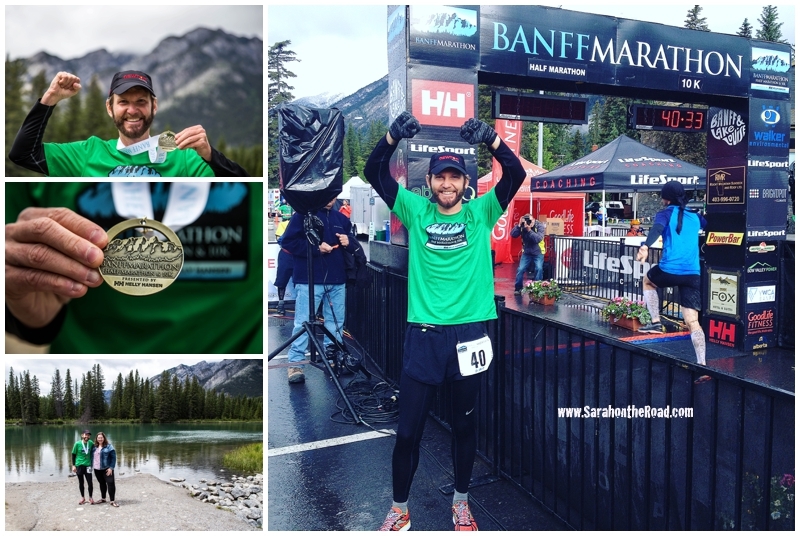 Back up to the middle of May, we had a random FB chat about him coming to Ontario to do a marathon… but he had committed to one in Banff and one in New Brunswick this year. (He just has completed running marathons in the 50 states (in just under 3 years!) and now is working on the 10 Canadian Provinces…plus some other international destinations…) So Ontario wasn’t in his plans for 2016. 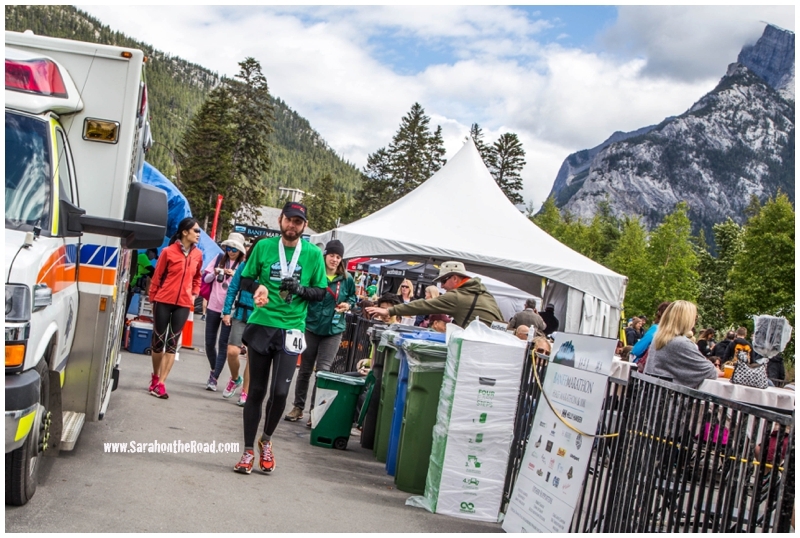 I asked him when he was going to Banff for the marathon…and luck would have it that it happened to be the SAME weekend I was in Canmore for Meghan and Todd’s Wedding so we decided to meet in real life! We got on the road extremely early—anyone who knows me knows I am NOT a morning person. But here I was Saturday morning of my holidays getting out of bed at 5:30am–quick shower then drove over to Keenan’s hotel to head out onto the road leaving by 6am. 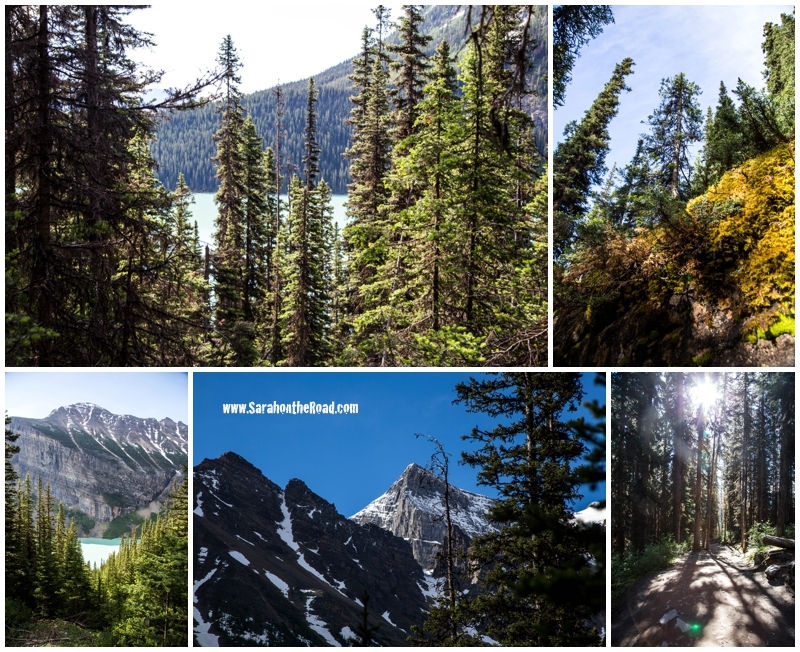 As much as I grumble about early morning starts…I totally learned something Saturday morning… early mornings are awesome, because the lakes were less crowded and the sunlight was FANTASTIC! 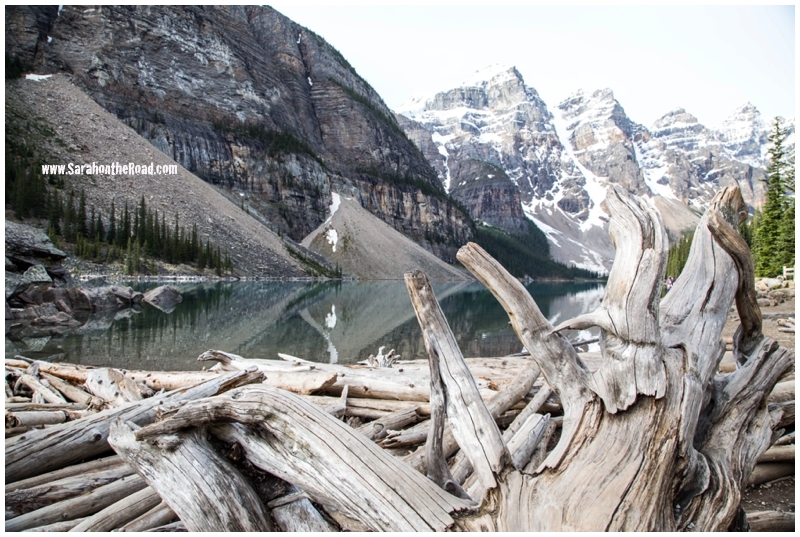 We headed towards Lake Louise…with a stop a Moraine Lake before getting there… it was so peaceful and gorgeous. A few hikers in the parking lot getting ready for a serious day’s hike… and a few photographers catching the morning calmness of the lake. A much different scene from when I was there with my mum the day before around 11! Look at that view the perfect reward for an early start to the day. 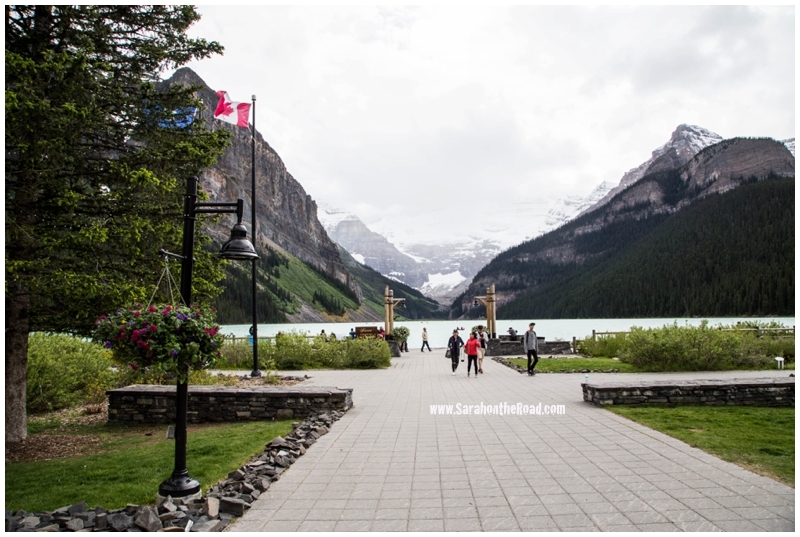 Our next stop was Lake Louise…such a calm & wind free day (not like the day before!) 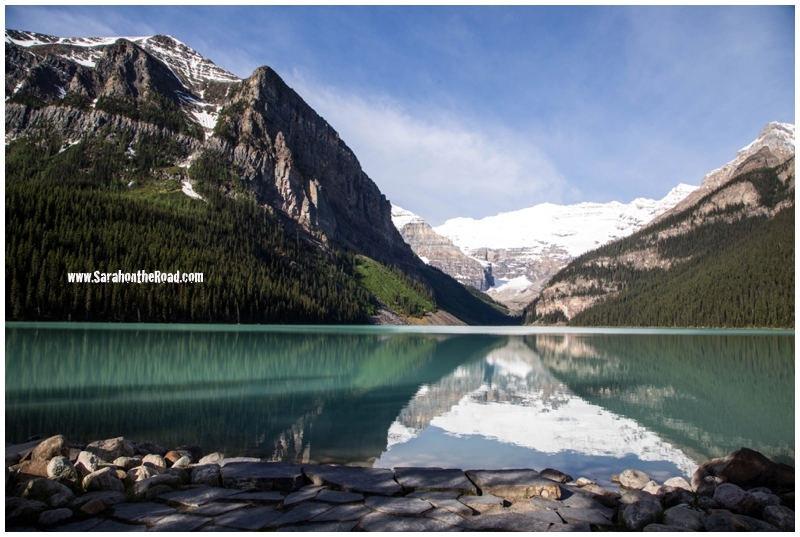 No clouds on the mountains… reflections perfectly clear… and the colour of that water– breath taking! 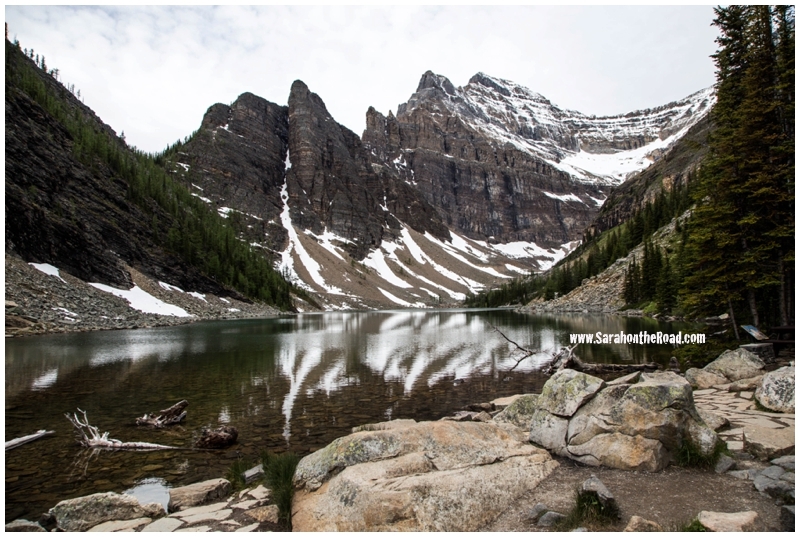 So when I was there with my mum I heard about the Lake Agnes Tea House. 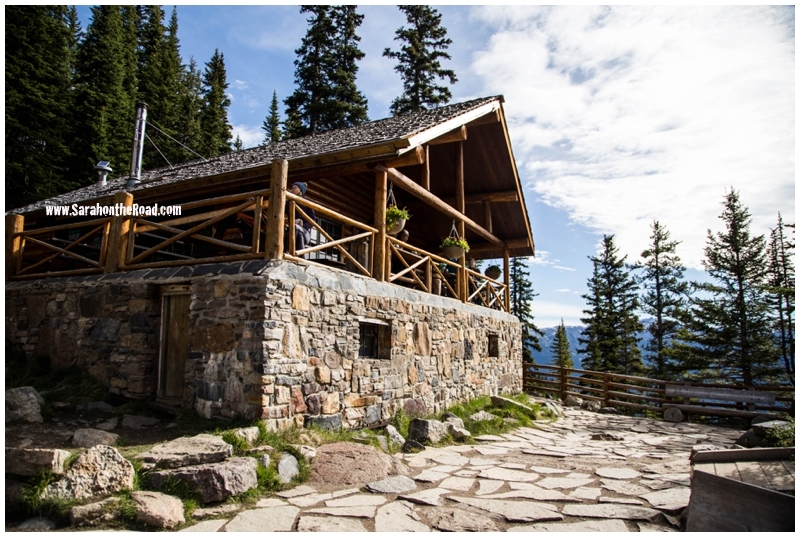 It’s been serving tea since 1905…at an altitude of 2,135 m… and about a 3 1/2 km hike from Lake Louise. I was like…I’d love to go there, but knew mum wasn’t up for that kind of hike. So I put that idea in the background. Fast forward to Saturday morning–I suggested to Keenan we head there. Almost immediately as I started sucking air heavily I regretted the choice. But I continued on… laughing and chatting all the way up that bloody mountain to the tea house. Sometimes just rambling nonsense—and wondering in my head —are we there yet? Actually this might have been out loud and not always in my head! It’s a really well maintained path–and only the last little bit is shared with horses (so have to watch out for the horse poop!) A perfect hiking trail. I’m so glad we started hiking early…because there wasn’t many people on the path. By the time we were coming down—the path was full of groups! Honestly, it was so much nicer of a climb because at times it was just Keenan and I on the path, rather than a HUGE group of people in front and behind us! 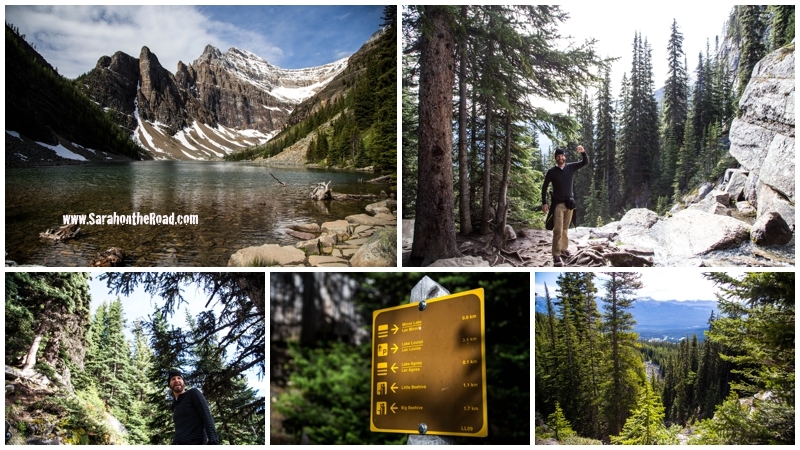 We finally arrived at Lake Agnes…and saw the tea house! I was so shocked I actually made it up that bloody mountain but then again, sometimes it’s the company you are with that makes the time fly! My view from the tea house… gorgeous lake and mountains and SNOW! So many tea choices… I had the Lady Agnes *something* berry… and honestly, I can’t remember what Keenan had–Though it was the first on the list! LOL We also had soup to warm us up. 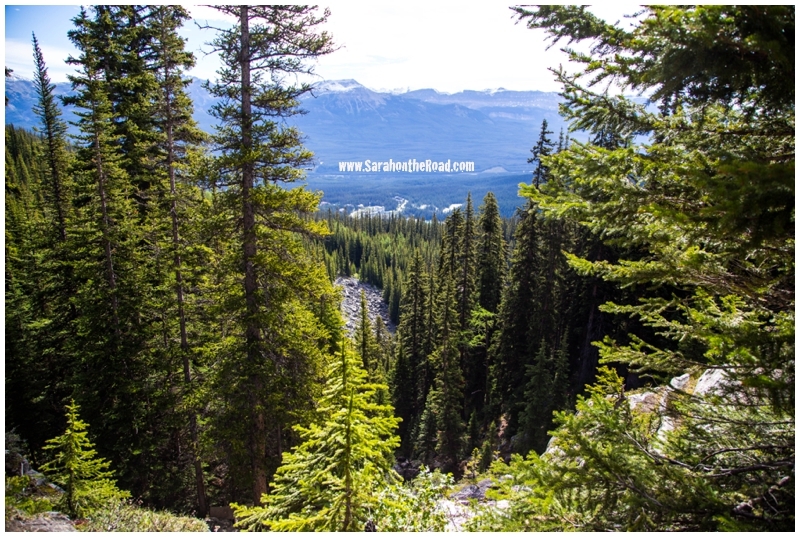 The view toward Lake Louise—it’s in the clearing around my elbow! Then we were heading back down the mountain… that was a fun it was all downhill! 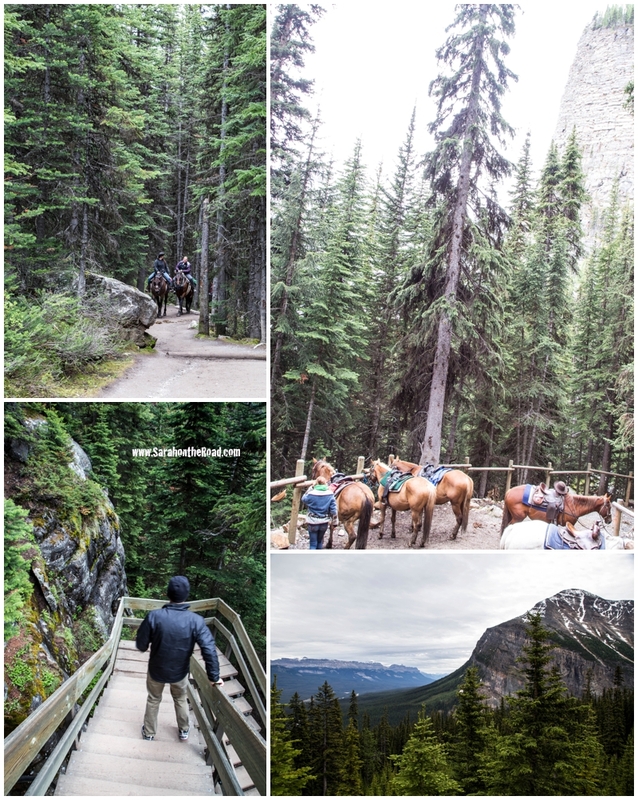 The first groups of people that came up via horseback had arrived—so it was fun to see the horses! 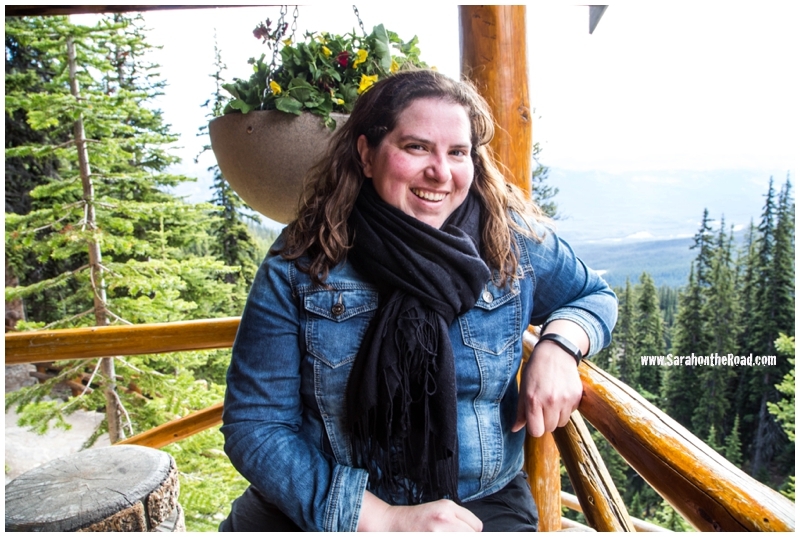 Some of the people that were hiking had all the gear—I prefer to hike in the Rockies with my jean jacket and black pashmina scarf… gotta have a bit of style! It was a perfect idea–thanks Keenan for joining me on that adventure…and sorry if I did grumble a wee bit on the way up! 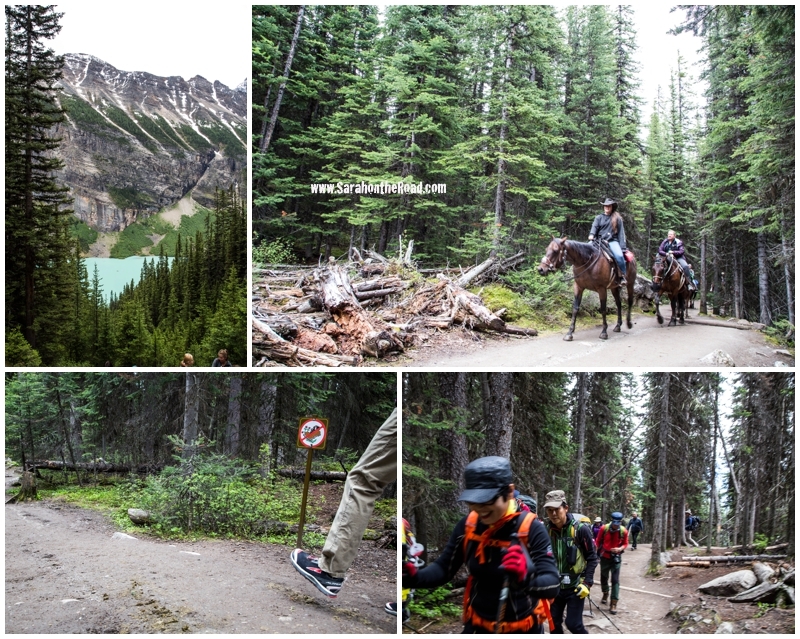 We left the day for hiking at this point…with me rushing back to Canmore to get ready for the wedding–and Keenan picking up his race bib for the race the next day! She said, he said…check out Keenan’s side of the story! 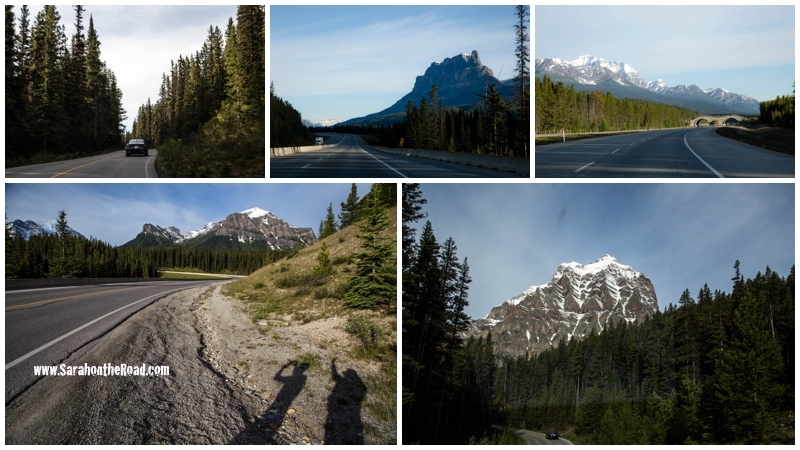 Sunday morning I headed up to Banff to see Keenan start his 65th Marathon…and his FIRST in CANADA! You can read about the run from his perspective on his blog! 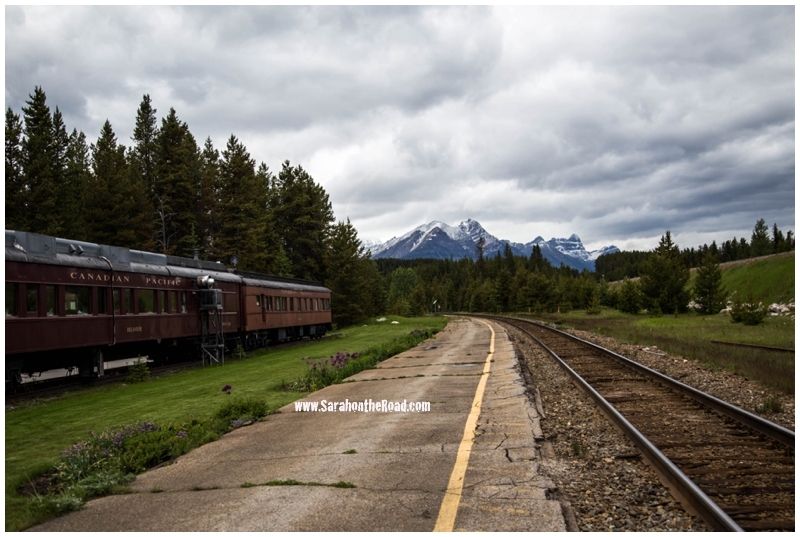 While Keenan was running… I headed back to Canmore to pack up & get mum so we could come and do some exploring around Banff! 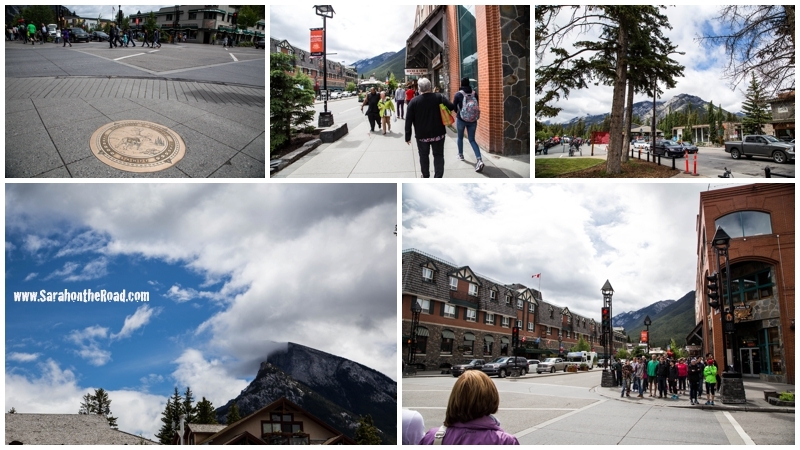 It’s so touristy–and so many fun shops to window shop in. However, there’s something so fun about a race and watching the runners come in… I had to wait to and cheer on everyone! 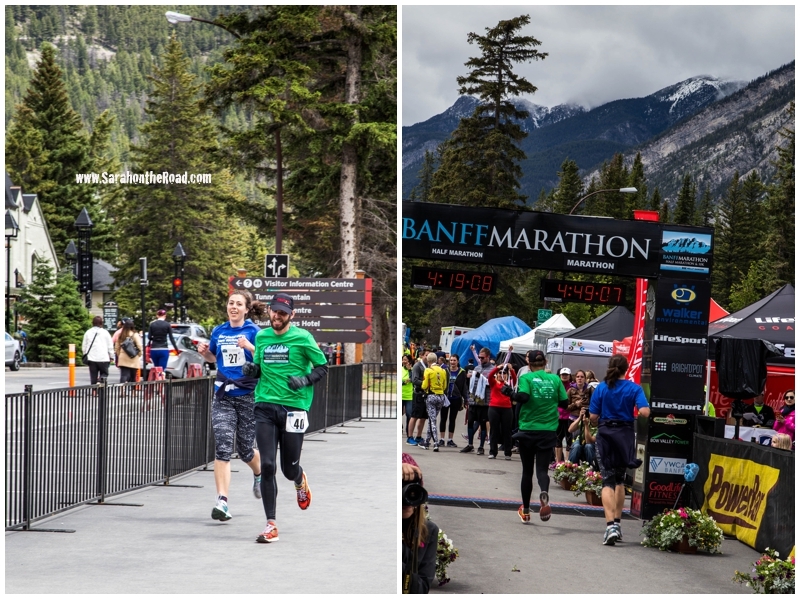 …Congrats on your first Canadian Marathon!!! It was fun to be able to see you cross the finish line. Keenan it was so nice to finally meet you in person! Keep on having your amazing adventures–you inspire me to have my own. 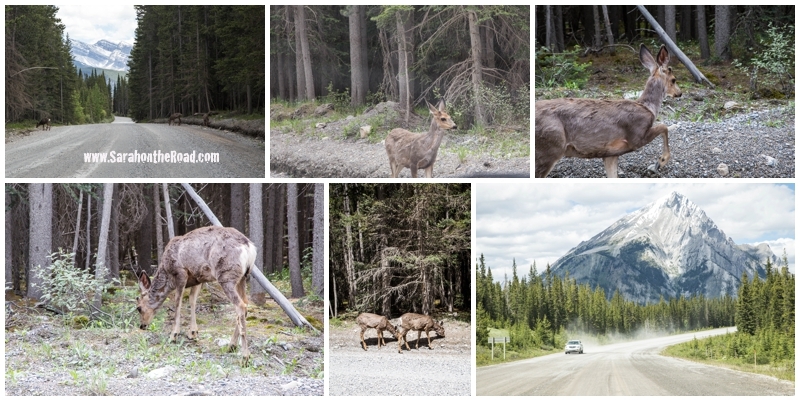 The rest of the day was spent driving…first back to Canmore to drop off Keenan at his hotel. 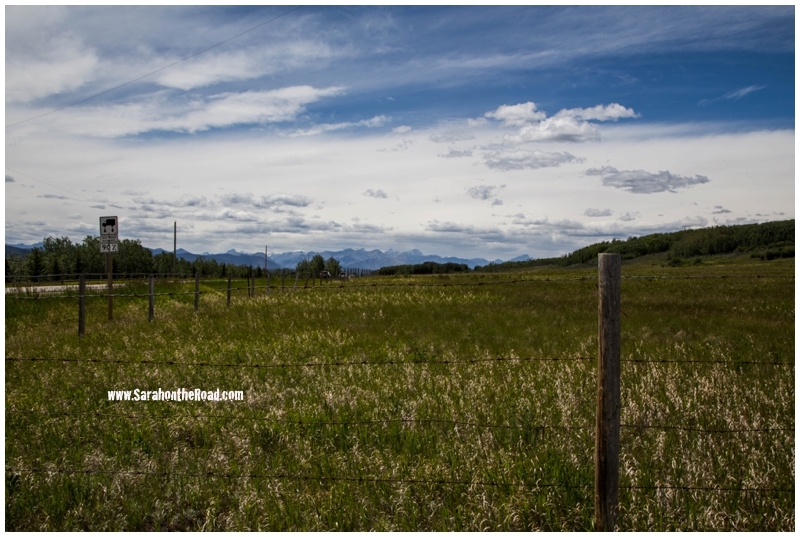 Then onto Calgary to the airport….where I joined my Gramma & Bart, Aunt Anne & Uncle Andrew, Aunt Marie & Uncle Chris and Clayton, Cody, Charlotte and Caroline for the flight back to Toronto…. I got the middle seat between mum and Clayton! 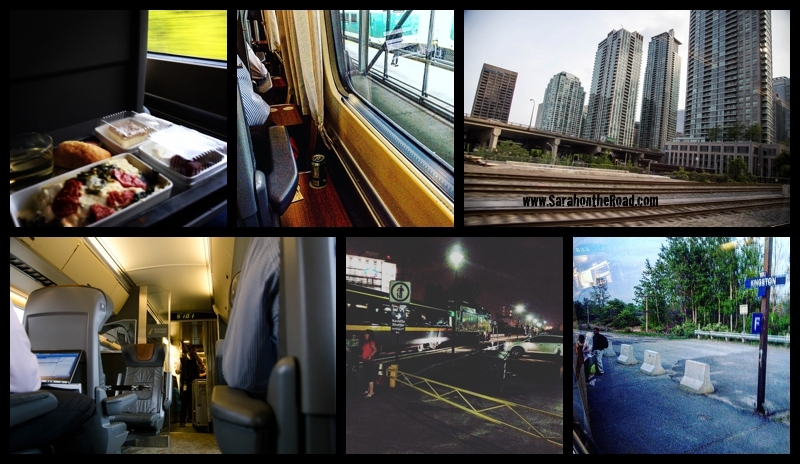 It was the end to the perfect weekend away…looking forward to my summer and new adventures! 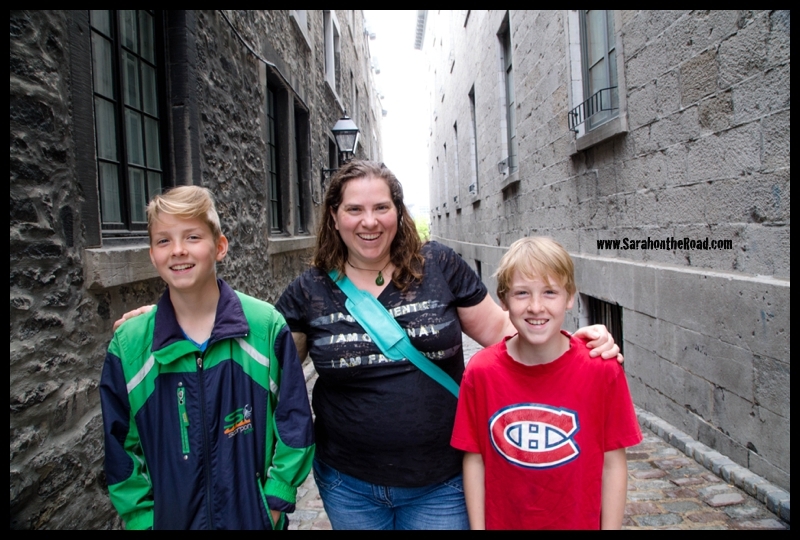 This entry was posted in Blogging Community, Friends, On the Road, Travel in Canada on June 25, 2016 by Sarah on the Road. 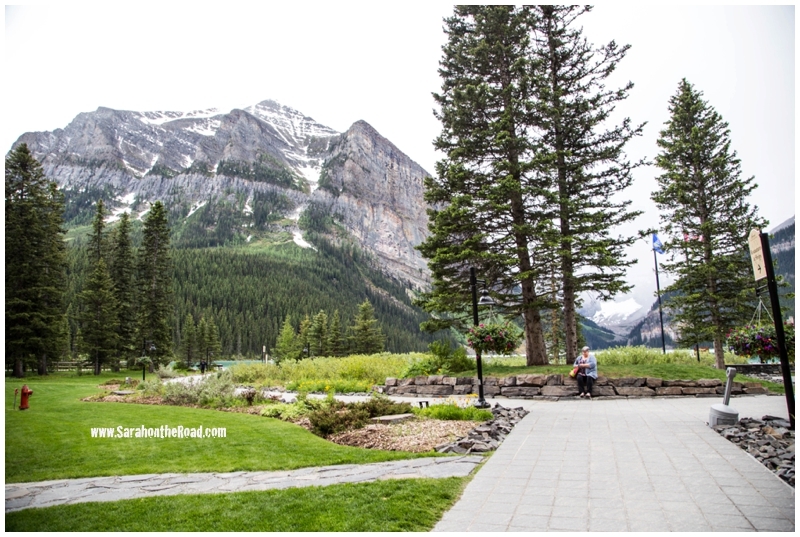 This past weekend my mum and I travelled out to Canmore, Alberta for my cousin’s wedding. 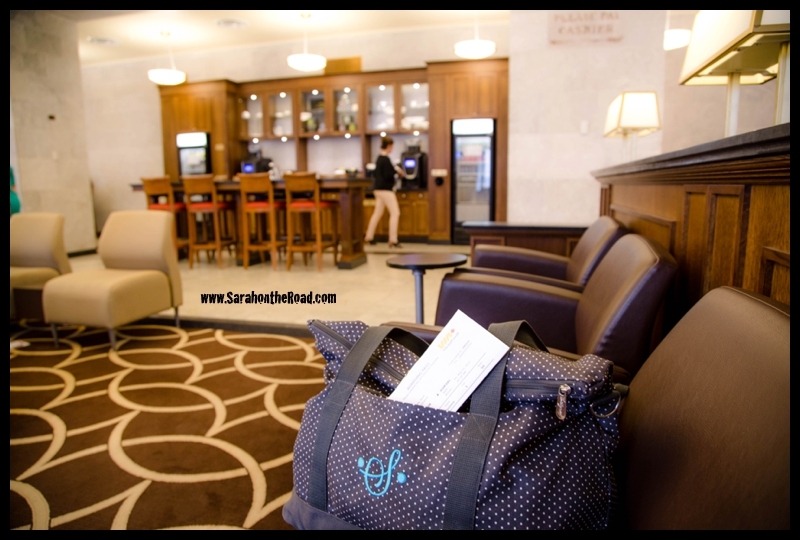 It has been a few years since our last mother-daughter trip...it was time to hit the road…and see what trouble fun we could get into! 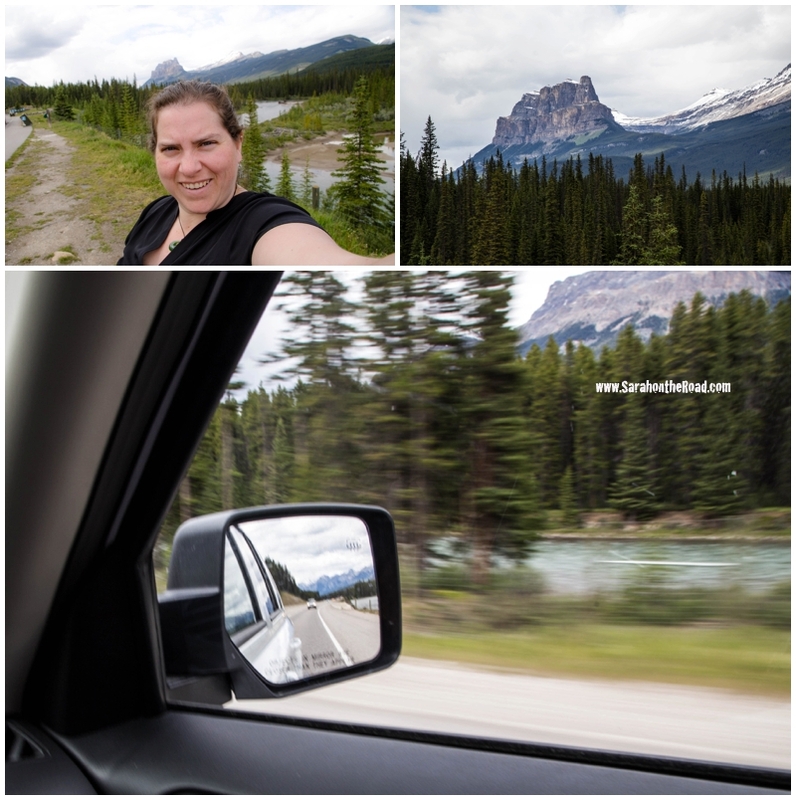 After we picked up the rental we took the road…I just used Google and I ended up not on the the Trans Canada Highway 1 to Lake Louise—but ended up on the 1A…it was a really fun route! 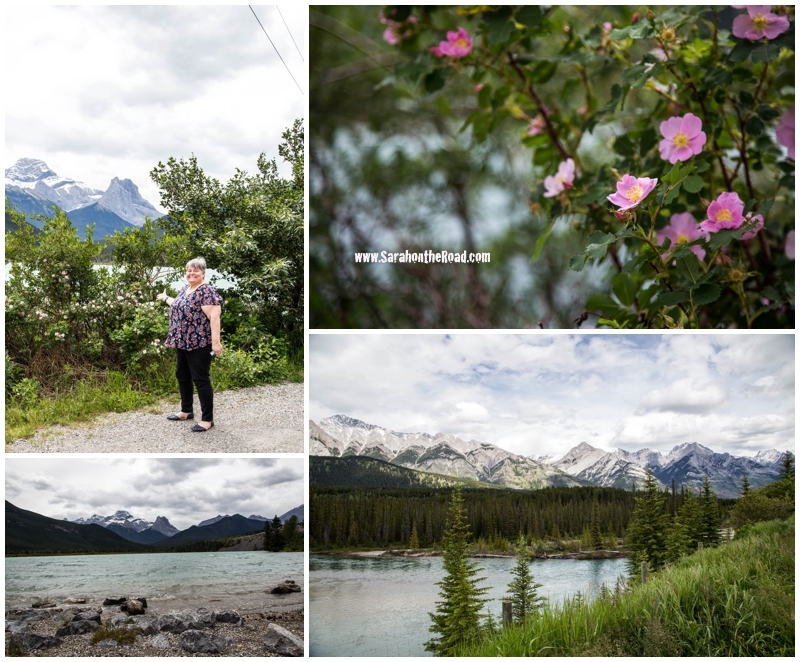 Stopping to smell the wild roses along the way…and excited to see fresh lakes and mountains!! This was the first time I’ve been on a plane in 11 months…which is a long time especially after my life and amount of flights I did in the 12 months prior! 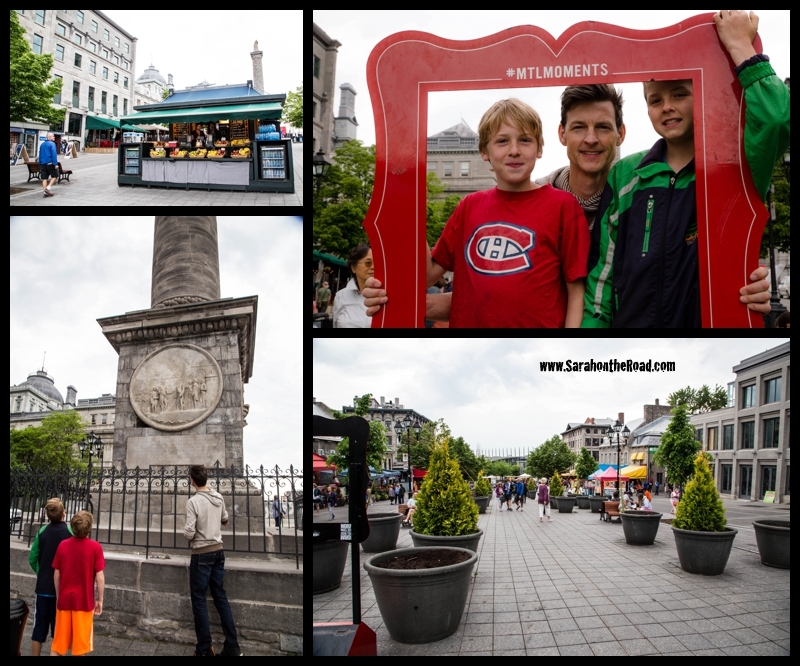 It was fun to be on an adventure again…travelling, taking photos and laughing with my mum. …I’m glad I argued with the rental car place and didn’t accept the ‘mini-van’ they wanted to give me…but ended up with a Jeep Patriot. I felt a wee bit guilty like I was having a secret affair on Milo…but OH did I LOVE driving that JEEP! (It was loaded…leather seats, sun roof (which we never used bc it was soooo chilly!) and satellite radio! 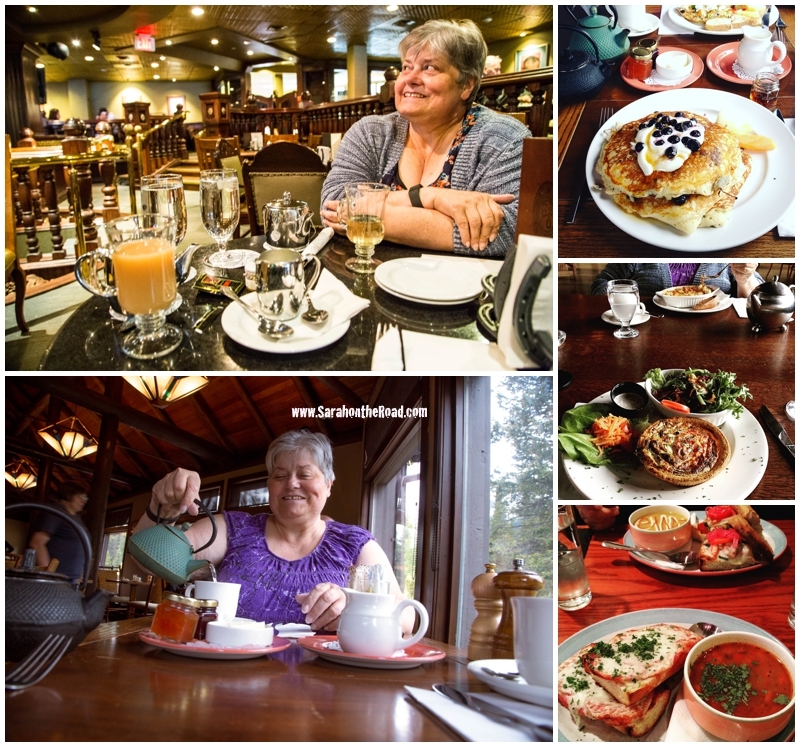 The food during our trip was amazing…I decided to randomly put together a collage of some of our awesome meals! The first night it was pretty cloudy and overcast at the lake…and it was WINDY! We had dinner at the Chateau Lake Louise. A brief history of the Chateau… The hotel was first conceived by the railway at the end of the 19th century, as a vacation destination to lure moneyed travellers into taking trains and heading West. 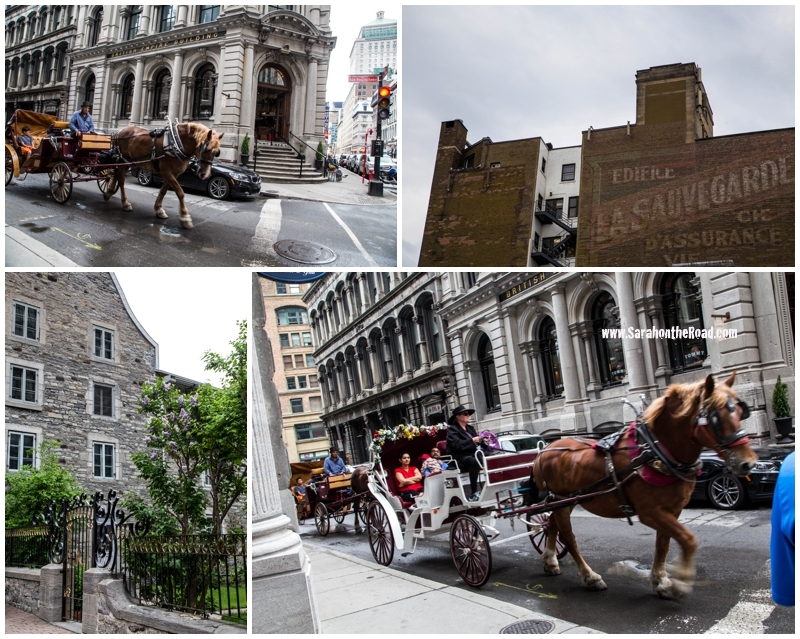 It has burned down not once but 2 times in it’s history… it is now part of the Fairmont Hotel Family. The grounds outside of the hotel are so amazing! Mum was very patient with me…letting me run around and take random photos while she sat and enjoyed the scenery and people watching of other tourists! 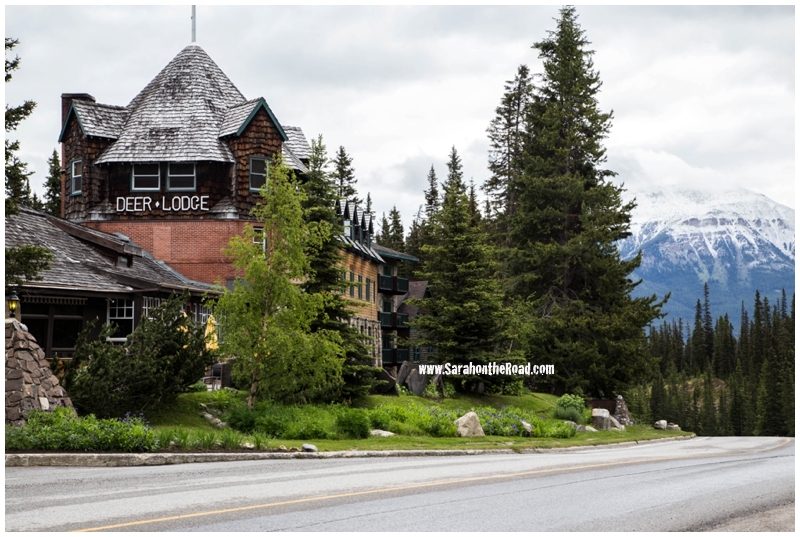 We stayed overnight at Deer Lodge…just a 5 minute walk from the lake. It was such a cool older resort…had so much character! 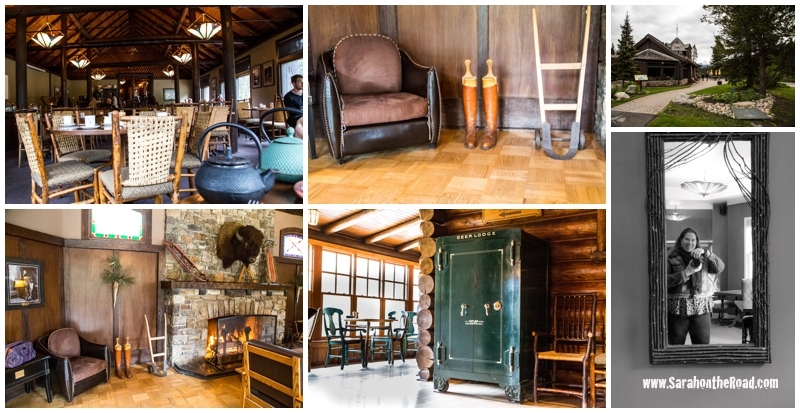 I LOVED it… think squeeky floors, high ceilings, comfortable beds…and old school lodge! The next morning before we left we went back to the Lake to see what we could see…but the clouds were pretty low on the mountains, but the lake was oh so amazing in colour! 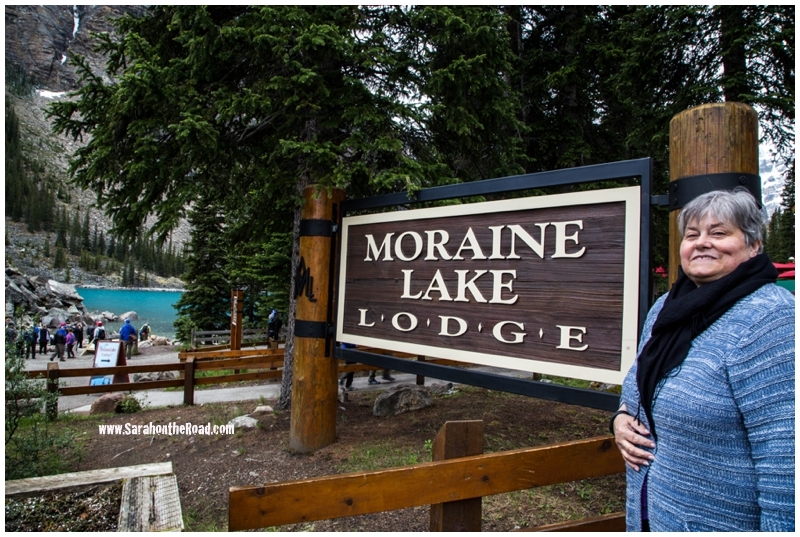 Our next stop was Moraine Lake…it was SO cold!! 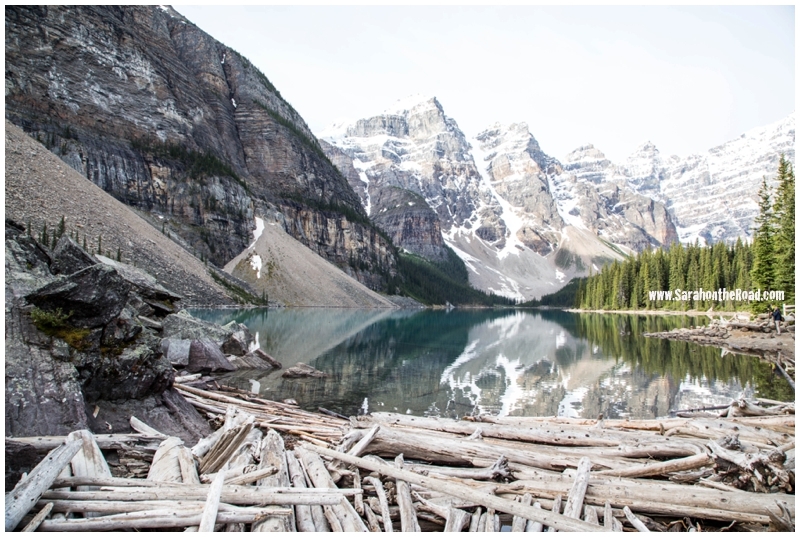 I snapped a few photos of the lake–but honestly, it was crawling with people…and hard to get the shots I wanted to get! 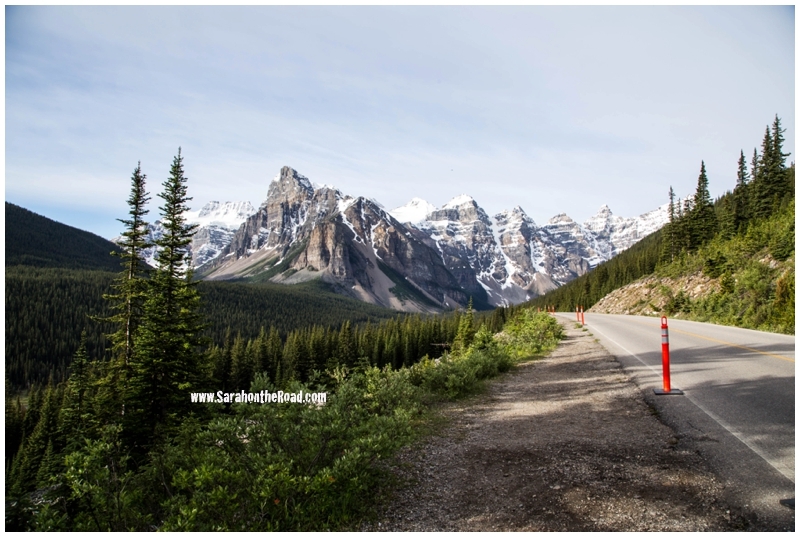 The views along the road to Moraine Lake were so amazing! 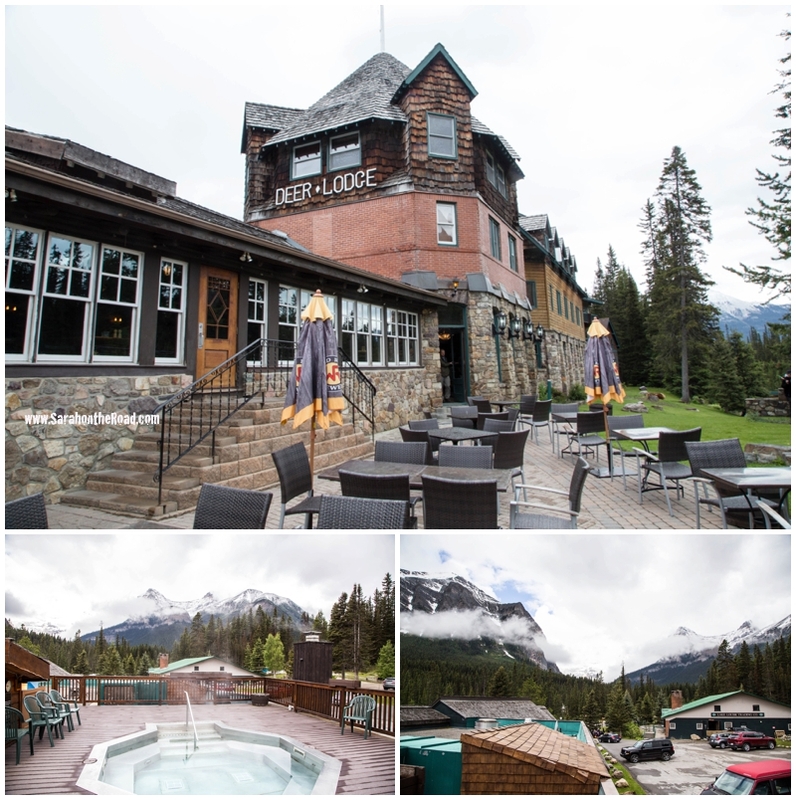 We had lunch at the historic railway station in Lake Louise—such great food… mum had the ‘dirty mac and cheese’ (with pulled pork in it)….I must admit I was a wee bit jealous! 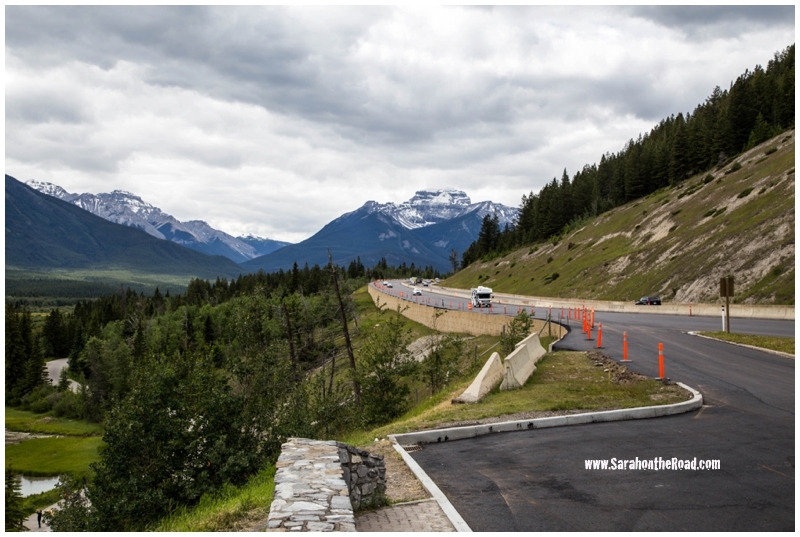 Stops along the road between Lake Louise and Banff… Mountains take my breath away! 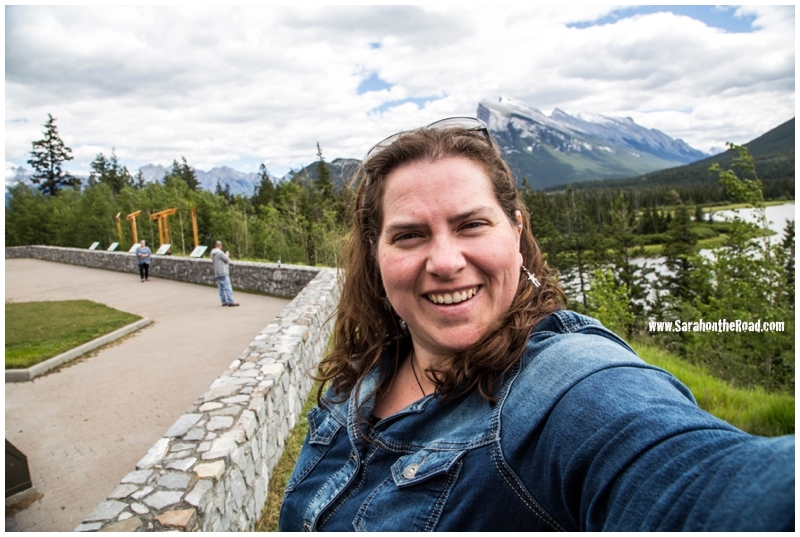 There’s always time for a mountain selfie!!! 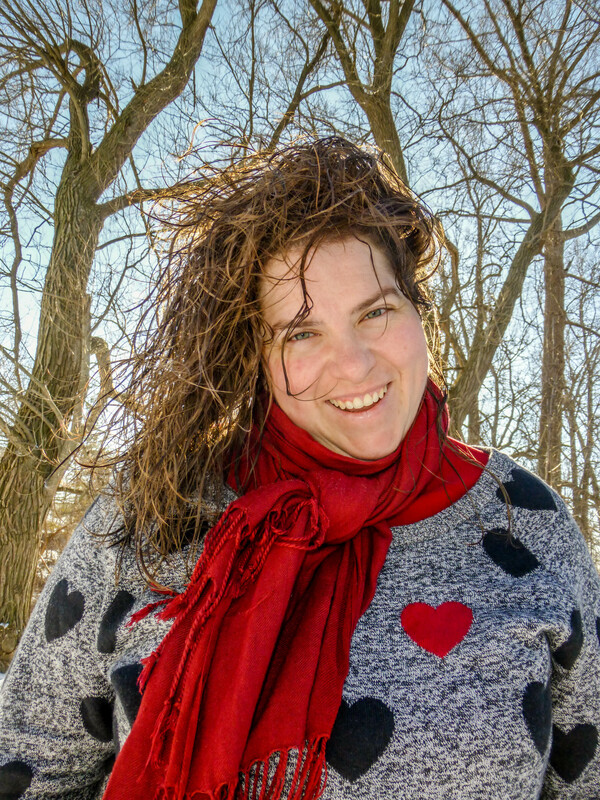 The laughter started when google lady said “you have arrived!” we looked at each other…and we were like… it’s a dirt road with TREES on either side… probably not the best place to have a wedding. 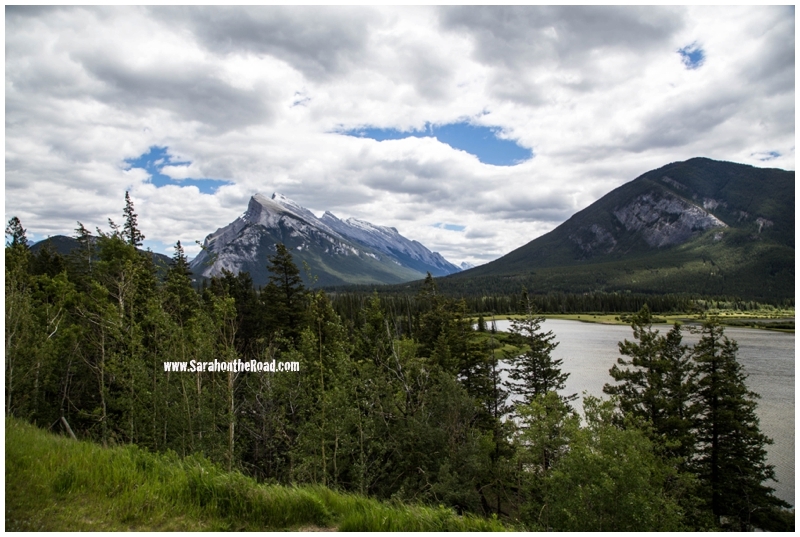 But honestly… that 2 hour return trek (in search of the wedding)…was one of the highlights of my long weekend away! So much laughter.. and fun and the trees, mountains and wildlife = perfect end to a crazy day! The weekend was just beginning…with a whole lot of surprises and more fun in store! I suppose I’m going to have to blog about that soon! 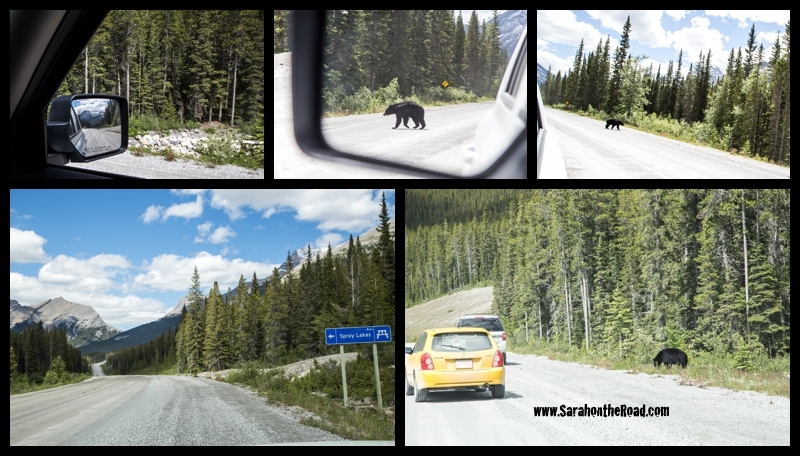 This entry was posted in Holidays, On the Road, Photography, Travel in Canada on June 23, 2016 by Sarah on the Road. 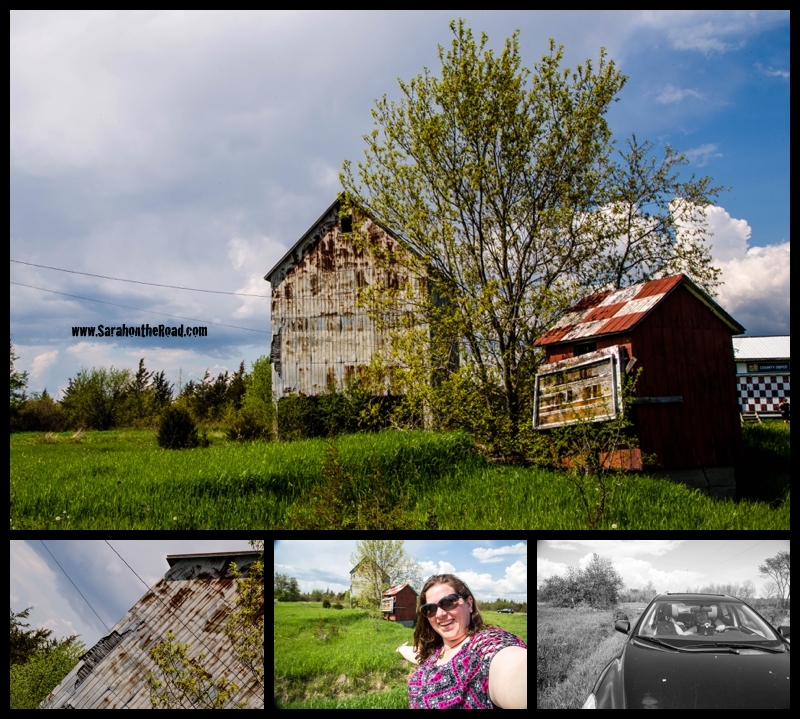 This past May 2-4 weekend I went to visit my friend Johanna in Trenton, Ontario. I had visited her last in February when I finished up my quilt and also have experiments with crazy cold weather and boiling hot water! 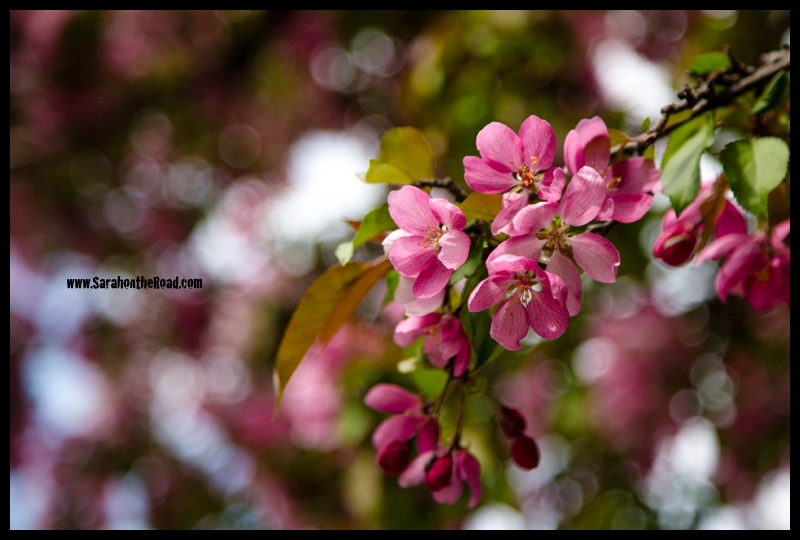 The Crab-Apple trees in front of Johanna’s house were in full bloom… so gorgeous!!! It was the perfect time to have a little photo shoot. The next day a lot of these blooms were covering the sidewalks and ground….seems like our photo shoot was perfectly timed! 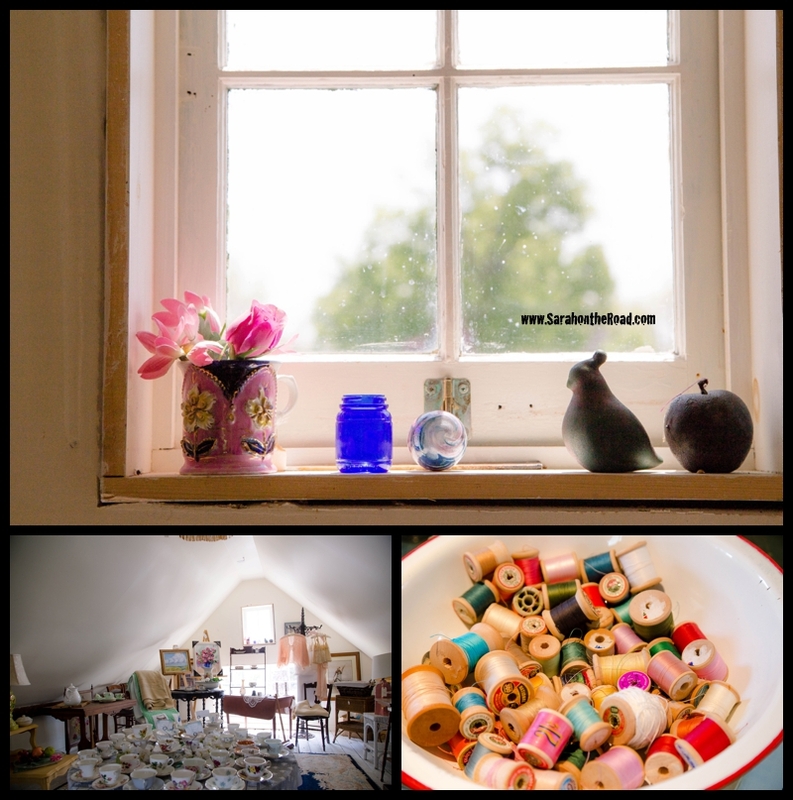 On Sunday we got up and decided to check out some yard sales…we decided to go on a bit of a road trip to Prince Edward County. Prince Edward County is located in Southern Ontario at the eastern end of Lake Ontario. It is an island community encompassing less than 700 square kilometers (270 sq mi), with over 800 kilometers (500 mi) of shoreline.The permanent population is approximately 25,000. We share our spectacular natural beauty with over 100,000 visitors each year. A popular attraction is Sandbanks Provincial Park, attracting thousands of visitors on hot summer days. The island community has retained a unique character that evokes fond recollections of days long past. 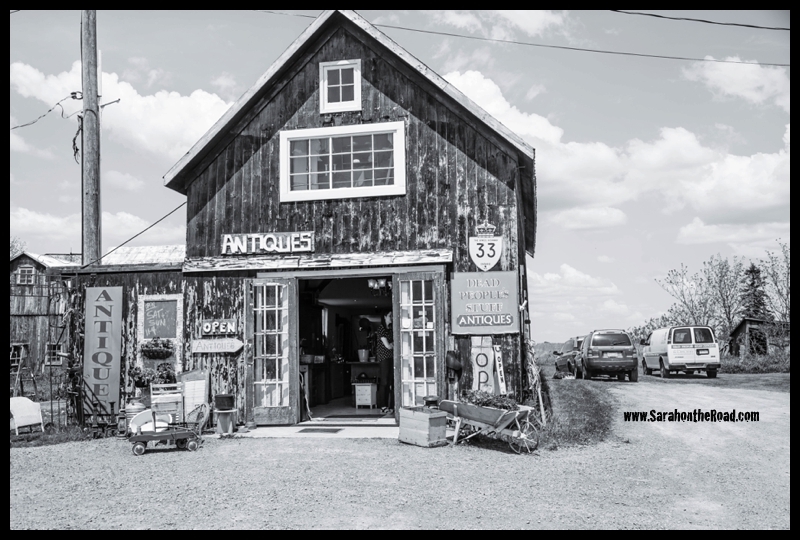 Idyllic country roads wind through historic towns and villages, countryside dotted with farms and vineyards, past artists studios and antiques shops, and along shorelines that border Lake Ontario and the Bay of Quinte. We continued on to Bloomington. 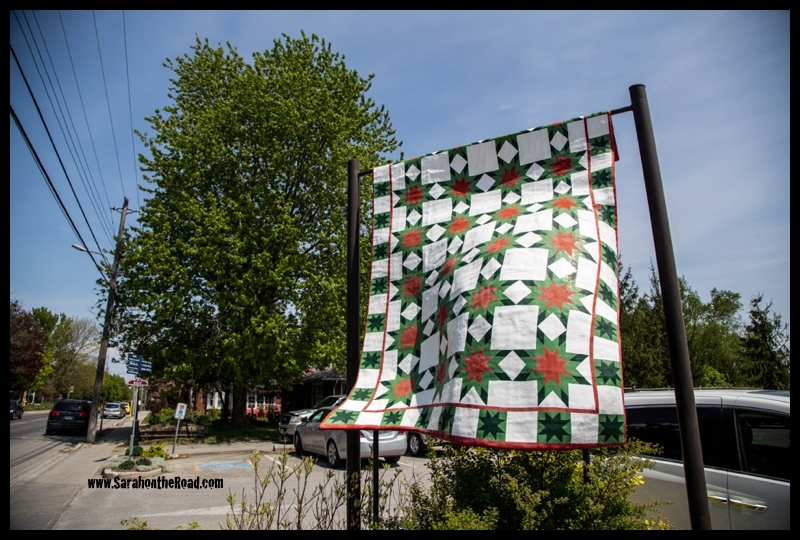 One of the things that Prince Edward County has started is a Barn Quilt Trail…it was so cool to see so many colourful blocks up in front of homes, businesses and barns as we drove by! We wanted to stop in the antique store called “Dead People’s Stuff” . The name of the store is perfect…and the store did not disappoint! 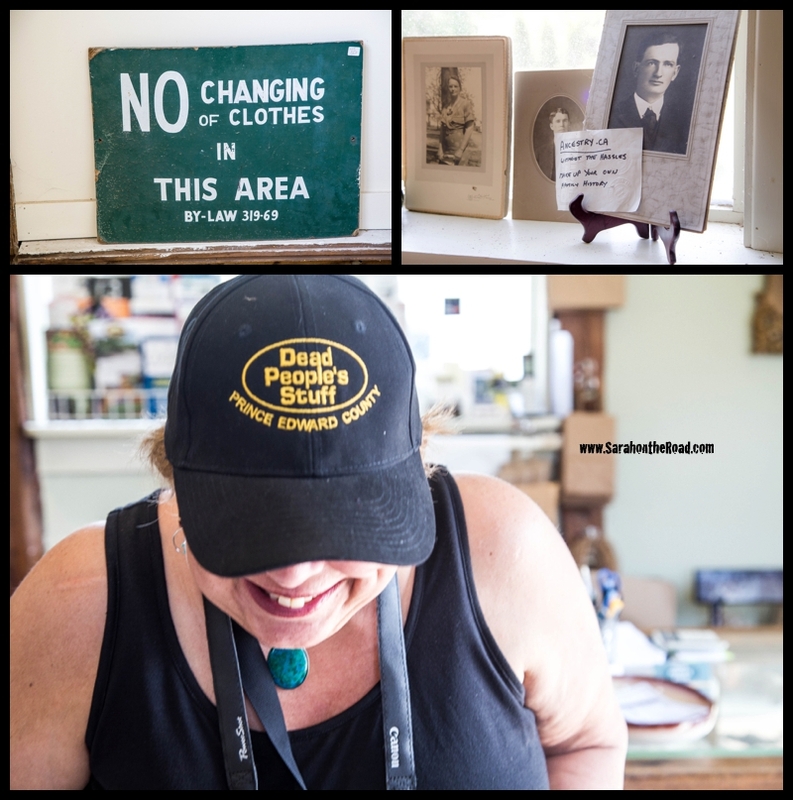 So many fun displays and signs… I love visiting antique stores and finding one thing that is the treasure I didn’t even know that I needed to have! …If I ever have a fence… I think I’ll be doing this to it!! 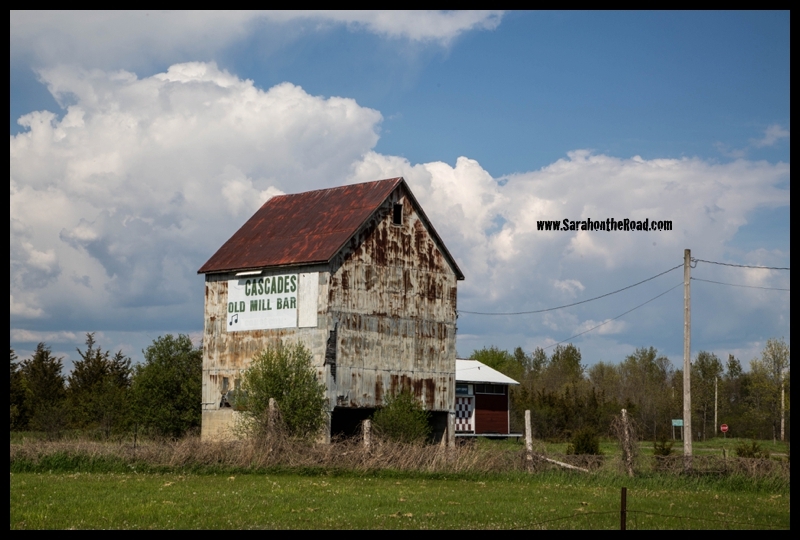 Road Tripping with another photographer is always fun…because they get when you see a cool barn or some run down buildings.. and say STOP let’s get some photos! We had to stop at theMurray Canal/Brighton Swing Bridge so that a boat could pass… it was pretty cool to see the swing bridge in action…and of course Johanna and I had time to steer our boat along the side of the water! Even with all that fun outside exploring in the evenings we did some planning. 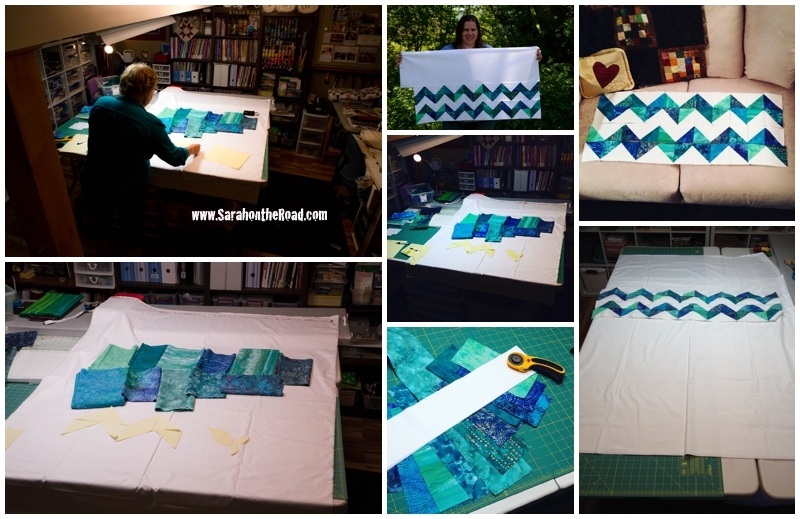 I did some cutting, sewing and piecing…starting my next quilted project! I will return in the summer to finish up this project. 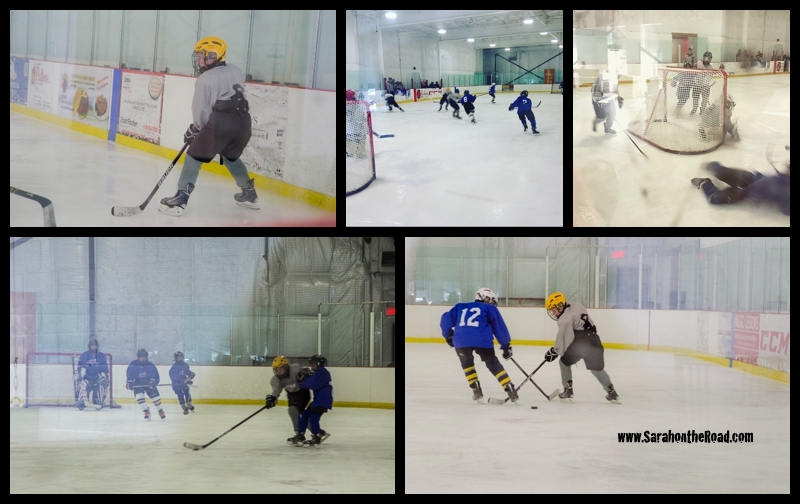 It was a perfect long weekend…the first in awhile I haven’t had to deal with snow! Thanks so much for your awesome company this weekend… I can’t wait until we see each other next! 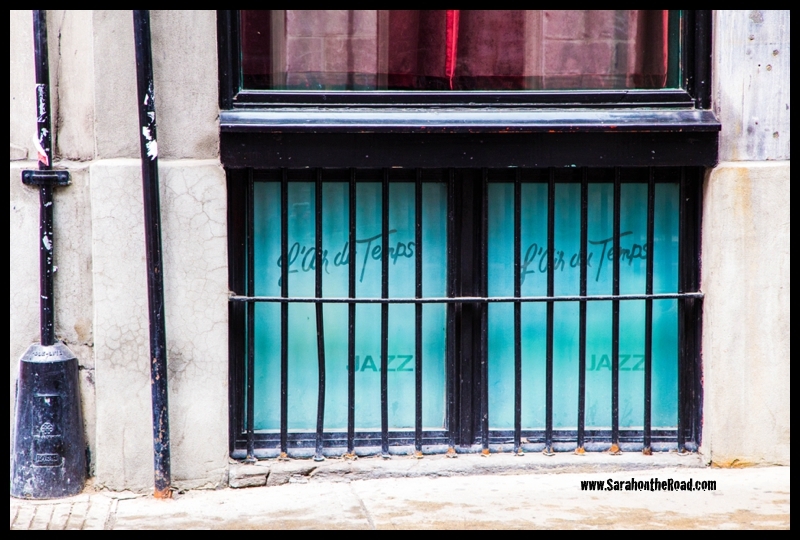 This entry was posted in Friends, Life in Ontario, On the Road, Photography, Whirl-Wind Weekends on May 24, 2016 by Sarah on the Road.